We know that your first instinct is to get online and search for something along the lines of, “pest removal for bats,” but that one sentence alone could cause you many more problems. Just as much as “pest removal” is not a search term you should be tapping out, “DIY bat removal” is also a very bad idea. Because, once again, the removal of bats is an incredibly specialized subject. Whoever does the work will not only need to have an understand of these flying mammals that goes above and beyond the regular kind of wildlife removal knowledge, the particular species is very important, as well as time of year. In almost every state, it is unlawful to remove, evict, trap, injure, kill, or touch a roost of any bat colony when it's a maternity colony — when the bats are birthing and rearing very young baby bats. In other states, you are not permitted to remove, evict, trap, injure, kill, or touch a roost of any bat colony unless you have the appropriate licenses and insurances. 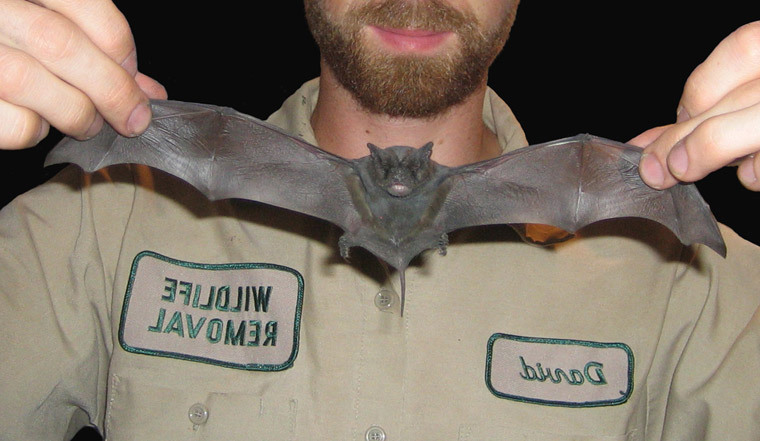 Some bat species are protected at not just a state level, but also a federal one. Bat species on the threatened or endangered list must be protected at all costs to prevent extinction, and human interaction and involvement is one of the biggest factors behind the decline in many bat species' numbers. Well, they might take your money and never come back to start with. That's the risk you take when hiring any contractor, and that's why we recommend that you do your research first. Can you see any review of client testimonials? Google or Facebook? They're usually great places to start. If they can't offer any reviews at all, you really do need to start asking yourself why not? The wrong bat removal company might also fail to remove the bats entirely; at which point you will have handed over your hard-earned cash and let these people into your home or place of work for absolutely no reason. This isn't always a deliberate act, of course; inexperienced or under-trained bat removal technicians can miss entry holes, bats, baby bats, guano, patches of damage, and more. Again, if you hire the wrong company for the job, you may find that the company manages to remove a couple of the bats in the colony, but the majority of them have been left in the building. The situation gets worse too; they don't just seal the bats up INSIDE your home or place of work, they are committing them to death. You will then have a much bigger issue on your hands — you'll need to remove live bats, dead bats, and then attend to the safety concerns and hazards to health that come hand in hand with both of those, including rodents and other pests. While we're on the subject of hiring the WRONG bat removal company, here's another thing they are likely to do: kill the bats. This is actually illegal on both state and federal levels in some states, and you could face punishment just as much as the person you hire to do the job, if you are caught in the act. Taking away the idea of unlawful acts for a moment, however, and people will really suffer if the populations of bat species keep declining. We are already suffering as a result of white-nose syndrome, which is decimating bat populations, across the species, and across North America too. There have even been signs that this killer disease is affecting bats further afield, including in Europe. So many things can go wrong when you use the WRONG bat removal company. If they don't do a good enough job, you will be left with a bat problem that you potentially don't know about, with a colony of bats dropping guano all around the place. Guano — bat droppings — is not only rife with disease, but is also a naturally corrosive substance, which means it will start to burn through walls, floors, ceilings, and other surfaces that it comes into contact with. A long enough bat problem could result in actual ceilings and other home or building structures collapsing, and that's before we even begin to think about the speed at which these colonies can grow. If there are fifty females in a maternity roost, ready to give birth, they can each have twins ... leaving you with 150+ bats. Some might even have more than two babies at a time; three, perhaps? It's a problem that quickly gets worse, especially when you think the problem had been solved by a professionals. 1. Don't hire a company that has “pest control” in the title. These usually deal with insects and other, smaller pests, and will also usually try to resolve the problem using fumigants or poisons. 2. Make sure you check the reviews. If there are happy customers saying happy things, there's a good chance that you'll have a great, humane, eco-friendly experience. 3. Call around for prices and quotes. The cheapest price won't always bag you the best or most complete service. Doing it yourself might seem like the cheapest option upfront, but almost always ends up being the most expensive approach, with various things that you try just not working at all. 4. Opt for an emergency same-day appointment if you are scared or concerned. Bat phobias are very common, but the right bat removal company will do everything in their power to help put your mind at ease. 5. Ask about their strategy. If you know what they are going to do, you can research it. You can ask other bat removal companies whether or not they'd do the same thing, or which approach they would take. Ideally, you're going to want to pick the service that is the most complete — removes the bats, seals the holes, prevents the problem from coming back in the future. Go back to the Bat Removal page, or learn about bats in the attic with my Bats in the Attic guide.